This October, BEING hosted our 5th annual Recovery in Art Exhibition. This year’s exhibition was held at The Muse, Sydney TAFE Ultimo. The exhibition featured artworks of 57 artists with a lived experience of mental illness, and included images of three group murals that decorate the walls of Cumberland Hospital. The Recovery in Art Exhibition was open to the public for two days and was visited by members of the local community and people from outside of the area. This year’s Exhibition was launched on October 7, with over 80 attending guests, artists and VIPs, including the NSW Governor The Hon. David Hurley and his wife, Mrs Linda Hurley, and NSW Mental Health Commissioner, Mr John Feneley. The launch was complimented beautifully with a musical performance by Aaron and Pukz, students of Sounds of The Streets at Creative Youth Initiatives. Tricia Crispe, one of the contributing artists, also graced us with an impromptu piano performance. Richard Bell, an artists featured in the exhibition, spoke about how writing poetry has helped him express and share his experiences in a positive and creative light. The NSW Governor also formally presented certificates to the artists in attendance. Click here to see more photos from the launch. On the first public open day of the exhibition, visitors enjoyed a colourful and moving music performance by Cosmo Gelzinnis. Cosmo is 15 and a singer, songwriter and pianist from Newcastle. He performed his original songs, which are based on his and other young people’s experience with mental health issues. Cosmo’s music is featured in the upcoming Open Cage Ensemble performance ‘a Midsummers Nightmare’ which incorporates music, dance and drama to tell the stories of many people’s lived experiences. You can catch Cosmo and the Open Cage Ensemble performing at Redfern Community Center on 27 and 28 of November. On the evening of October 8, BEING – in partnership with Sydney TAFE and headspace Camperdown – talked to a number of students about dealing with stress and staying well. The talk included topics such as signs of concerns to look out for in themselves and in other people, how to be supportive, and what services are available. Students heard from Alessandro and Cassie about their experiences of living with mental illness. They also heard from the Sydney TAFE Counselling Unit and headspace Camperdown about what support is out there and why getting help is important. BEING would like to thank all the artists who contributed to this year’s Recovery in Art Exhibition. We would like to thank our event partners: Sydney TAFE, headspace Camperdown and WayAhead for helping to make this year’s Exhibition a success. We would especially like to thank all those courageous souls who shared their stories and experiences of recovery with us over the past week, as well as the volunteers who helped us out. 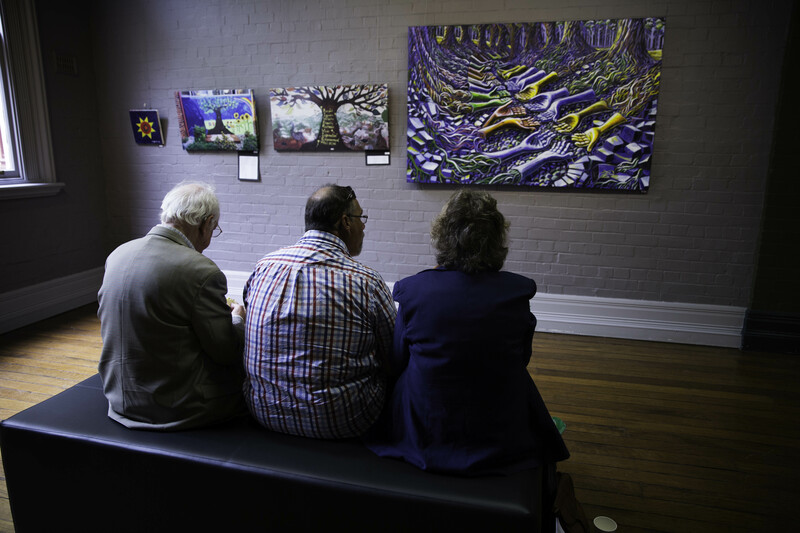 Click here to read an article published in the Sydney Morning Herald about Recovery in Art 2015. Banner artwork by Shelley Kay for the 2014 Recovery in Art exhibition.